This section deals with the various types of functions which occur within the club. The events are primarily centred around slot racing, with a few social events thrown in. Each section listed to the left deals with the subheadings of the events. Race nights occur, generally, every third Thursday night. 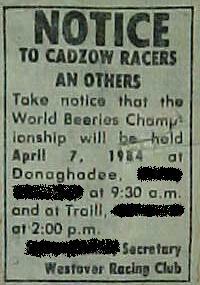 The events alternate between Donaghadee and Traill. The racing starts at a set time, and practice occurs anywhere up to an hour before the start of racing. There are generally 4 race nights for each half of the season. The final race night of the 2000-2001 season was held Thursday, April 19 2001. A record of that racenight has been posted in the history section. The opening race of the 2001-2002 season is Wednesday October 3 at Donaghadee. 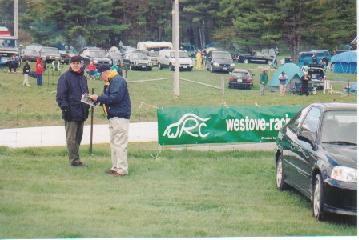 Club Championships occur once a year, at the end of the racing season. They tend to attract members from all over, including those for whom the travel would prevent their regular attendance during the season. The Championship is held on a Saturday, with racing starting at 9:30 am at Donaghadee. A full race schedule is run, and then the championship moves to Traill. After lunch, a second full race schedule is run. If the same racer wins both halves of the Championship, he is the new Champion. Otherwise, a four-man runoff is held between the winners of each half and the top two by points. The runoff is held at Traill. The 2001 Club Championship was held Saturday, April 21. Details of this and previous Championships may be found under the history section of this website.